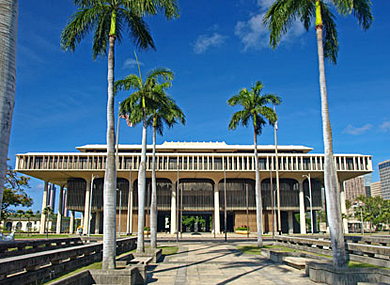 The Hawaii senate passed the final version of a civil unions bill by an 18-5 vote Wednesday afternoon. The bill will now go to Gov. Neil Abercrombie, who has expressed his support for it. "Today is a momentous day," said Sen. Clayton Hee, according to the Honolulu Star-Advertiser. "There is no denying that by this action Hawaii takes a significant step towards true equality." Equality Hawaii and the Human Rights Campaign issued a joint statement about the bill's passage Wednesday. "We honor and thank the legislature today for their commitment to equality for the lesbian, gay, bisexual and transgender community in Hawaii," Alan Spector, cochair of Equality Hawaii, said in the statement. “For the second time in less than a year, legislators have dedicated themselves to providing dignity and respect to all families in the Aloha State." A similar bill was approved by the legislature in 2010 but vetoed by then-Gov. Linda Lingle after a long waiting period.